Discovery Dock is a modern residential development set on the edge of the South Docks of Canary Wharf, and moments from the centre of Canary Wharf, with South Quay DLR (Docklands Light Railway) station just moments away. Apartments available within the building include 1 & 2 beds. 1 beds are approximately 600 sq ft, and provide a reception room with semi-open plan kitchen, and a separate bathroom. 2 beds are approximately 850 sq ft, and provide a reception room with semi-open plan kitchen, master bedroom with en-suite shower room, and second bedroom with separate family bathroom. 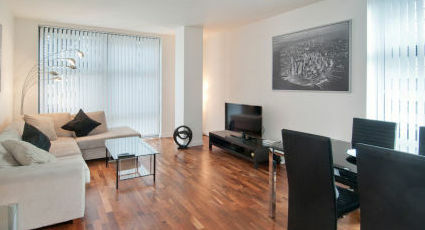 All apartments have wooden flooring to living areas, and carpeted bedrooms. The building has a 24 hour reception, and car parking is available at an additional cost. Apartment facilities include bed linen, towels, weekly cleaning, complimentary internet access, TV, dishwashers, washer/dryers and fridge freezers. South Quay District Light Railway station is moments away, alternatively guests can access Jubilee line services from Canary Wharf tube station which is a few minutes walk away.